I was confronted with an interesting dilemma recently. The patient had recently got married to an older man who already had three children from his first wife. This was her first marriage and she wanted babies, but she was already 39 . When she did a blood test , she found out she had ovarian failure , and would need to use donor eggs. She was quite comfortable with the idea because she wanted a baby desperately, but her husband put his foot down and said he wasn't willing to consider using donor eggs under any circumstances, because this was against his religious beliefs. She was extremely unhappy , and did her best to cajole him, but she wasn't able to persuade him. She came back to me after a year's time and said, "This is what I plan to do. I'm going to ask him to deposit and freeze his sperm sample in your lab. I'm then going to come to Mumbai without him, and tell him that you superovulated me, collected my eggs ; created embryos with my eggs and his sperm; and transferred these embryos into me. In reality, you can use donor eggs instead of my eggs, and he will be none the wiser, because he will believe that the embryos were made with my eggs. This way, I'll get pregnant and have a baby; he'll be happy; and I'll be able to save my marriage." She made it sound like a sensible solution , because it keeps everyone happy. After all, if he doesn't know we've used donor eggs, then why will he object ? After all, she is an adult, and is simply asserting her right to use donor eggs to have a baby. The problem is far more complicated, because she is married to him. We need informed consent when we do IVF treatment, which means both the husband and the wife need to sign the consent form. I told her that if we don't get the husband's signature , we can't go ahead. She said, "But he lives in Lucknow, and it's not convenient or possible for him to come down just to sign a form. Why don't you give me the form , and I'll get his signature , and you can then proceed with my treatment." I have a suspicion she is going to do some hanky-panky, because she is so desperate to have a baby. She may forge his signature, and I can't countercheck whose signature it actually is - I am not a notary ! Once I have a signed consent form , I can then go ahead with the treatment, because I have complied with all the regulations. However, I am worried that she is not being truthful with her husband. Now it's true that she's doing this in order to save her marriage , and she's not hurting him in the process. When I asked her what happens if he finds out the truth after six years, she sensibly pointed out that the chances of his doing so are close to zero. 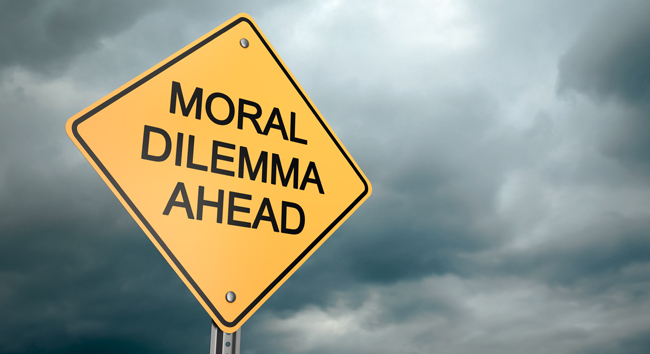 Doctors are confronted with these complex ethical dilemmas when we practice medicine, and it's very hard to find the right solution. It's easiest for me to refuse to help her. I can put my interests first, and turn her away, because her husband does not see eye to eye with her. This would protect me, but it would not be the best solution for her, as she would be doomed to remaining childless all her life. I could also say - " I have an informed consent form, which means I have complied with the letter of the law . I can go ahead with the treatment and help her to have the baby she so deeply desires". But would this be ethical ? Now I can justify my actions by saying I am doing this in the patient's best interest - having a baby would add meaning and joy to her life, and would help her to save her marriage. On the other hand, the counterargument could be that I'm doing this just in order to earn more money ! How does one sort these things out? How does one parse them? If things go well , there's never a problem, but what happens if they have a dispute and need to go to court after five years ? No matter how good my intentions may have been, no one willing be willing to accept that I treated her without any selfish interest. Both the lawyer and the judge will paint be as being an unethical, greedy doctor, and give me a hard time. Why should I take on that risk , for no personal benefit at all, other than the fact that I want to help my patient? You did the right thing..